I've been putting off having to write about the orchid collection in the Singapore Botanic Gardens - possibly because I know I absolutely have to? 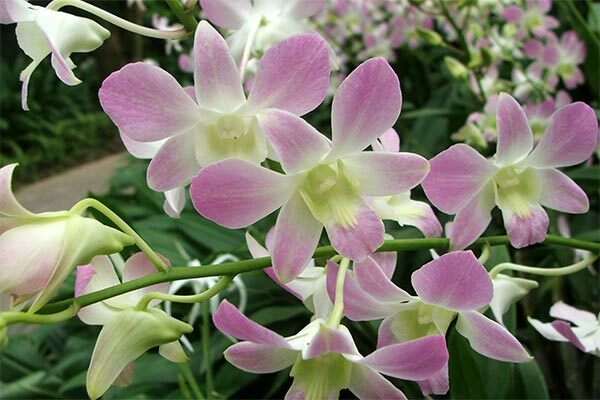 A garden reporter cannot be rebellious, not as far as the Singapore orchids are concerned! I might try some visualisation. 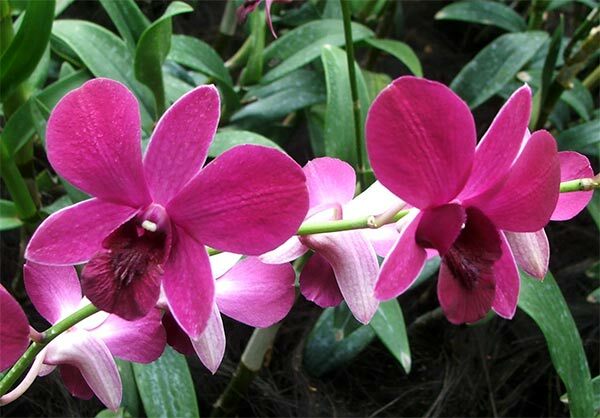 If I was a Singapore orchid, what would I like to be? Or perhaps I could be a VIP orchid, taking my place in terribly important company of world leaders, and the wives of Excellencies. My goodness, this feels much more like it! Other lucky people, important and in the public eye, can have begonias and roses named after them - like English rugby player Martin Johnson and Queen Elizabeth of England, respectively. 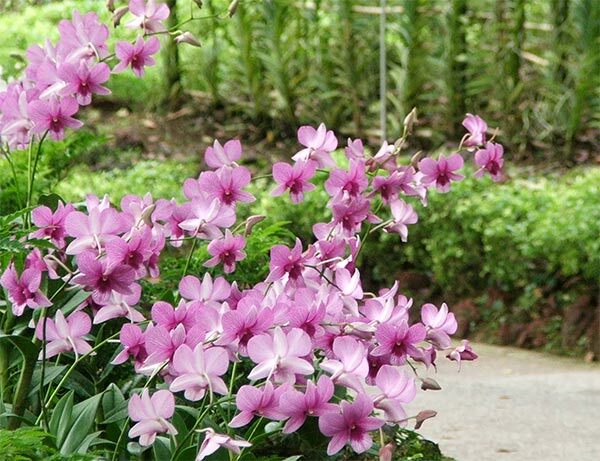 But if you are a VIP visiting Singapore you get an orchid. And you don't get plonked in anywhere - you get a place in the VIP Orchid Garden. That Dendrobium Dame, Margaret Thatcher, was definitely sulking during my visit - she wasn't interested in showing any flowers. 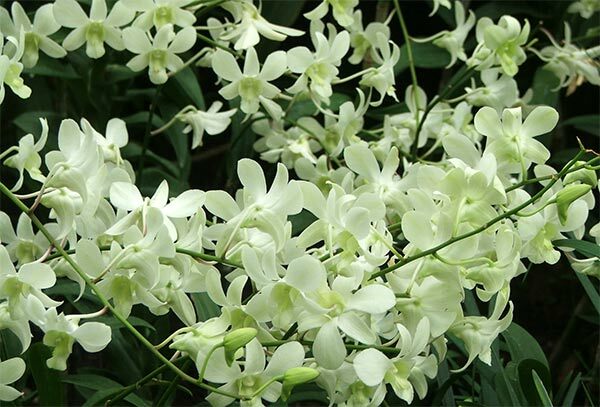 My favourite VIP orchid was the wife of a visiting European dignitary. Did I photograph the label? I hope so! Some orchid facts follow. 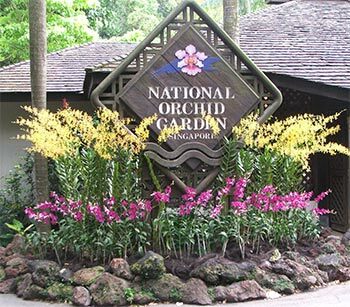 An early director of the gardens experimented in orchid breeding and hybridisation, which lead to Singapore's commercial orchid growing operations. The present orchid enclosure has 20,000 orchid plants on display, some sprawling naturally down the slopes, others tucked into pots. Readers who demand more precice information and correct naming must accept my apologies. I loved the orchid displays, particularly those out in the open growing alongside paths, as if they were 'normal' garden flowers. An orchid enthusiast would write a much better story, but still - shyly, with novice eyes, I've done my best. For a first timer!